This is officially the coolest gizmo I have seen to date! With the MiFi 2200 device and mobile broadband service from a national cell provider, you have a portable Internet hotspot that can fit in your pocket. 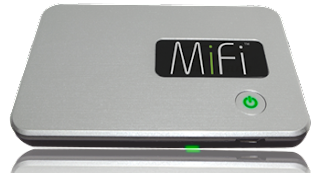 With the MiFi running, up to 5 WiFi enabled devices can get high-speed Internet. With the simple push of a button, the MiFi turns on and connects to your broadband carrier. No wires or cables to worry about. The MiFi runs on a rechargeable battery, so you don't even need to have it connected to work. For those who are worried about security, the MiFi offers standard WiFi Security through WEP/WPA/WPA2–PSK, and SPI Firewall. Not bad for something that measures .5" (H) x 2.3" (W) x 0.4" (D) and weighs only 2.05 oz. All in all, this is a fantastic new device. If you have one, let me know what you think in the comments below.